Home » Community Happenings » Friday at the Forklift: a ReUse Apparel pop-up shop AND a Simplicity Day Sale! Friday at the Forklift: a ReUse Apparel pop-up shop AND a Simplicity Day Sale! Today, we met some great folks who are filming a documentary called “REUSE! Because you can’t recycle the planet.” Alex Eaves (and photographer Ali Morris) are traveling the country to see how reusing is not only eco-friendly, but a win-win-win for people, planet, and wallet. For the Maryland stop, they decided to feature Community Forklift! Cool, huh? Even cooler: they’re coming back to the ‘Lift tomorrow, Friday 7/12 from 3-6pm. 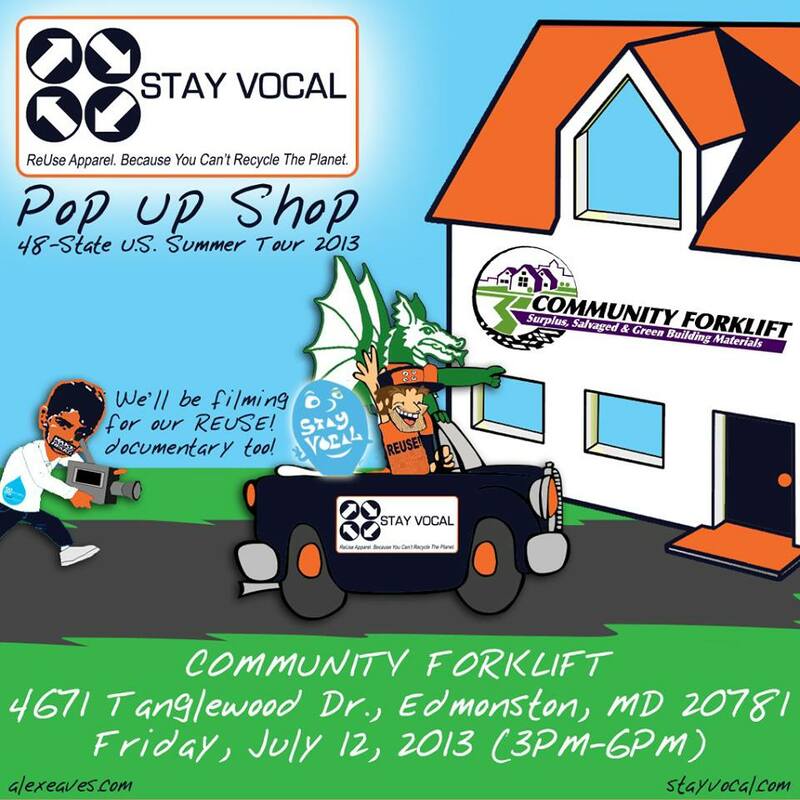 Come by to check out their pop-up shop, offering Stay Vocal ReUse apparel and accessories (they’ve even got doggie bandanas – and they’ll be donating a portion of the proceeds to Community Forklift). They’d love to meet you, answer questions about their journey and their film, and learn about how you reuse. Here’s a bonus reason to come by tomorrow: it just happens to be National Simplicity Day! To celebrate, we will be offering 20% off Community Forklift items all day long (The Simplicity Day Sale does not include items from our consignment partners, select specialty items, and items with missing or damaged price tags) . Hope you can come by!